3 Bedroom Detached House For Sale in Hailsham for Guide Price £450,000. A detached three bedroom cottage in a sought after rural location with large gardens and an open outlook to the rear. 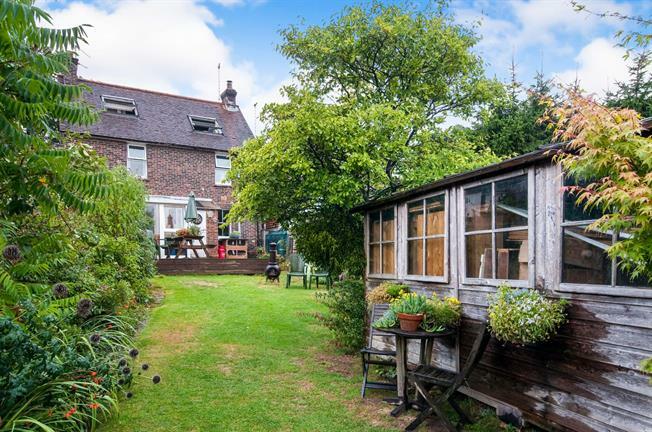 The property benefits from oil fired central heating and partial double glazing with character features to include sash windows, stripped wood internal doors, open fireplace and large rear garden. Works have been completed during the owners tenure to include, new roof, rewired, damp proof treatments. The property further benefits from ownership of a double garage on a small piece of land measuring approximately 98ftx35ft. The accommodation on offer comprises of, entrance, double aspect lounge with open fireplace and fitted wood burner. The dining room leads through to kitchen and there is also a UPVc conservatory leading onto the rear garden.